Weird thing is, apparently the unfinished "beta"/"Special Edition" of this game is more common than the final version and is even available with DVD MPEG2 videos, which you miss out on in the final version. Last edited by ZellSF on 2017-7-31 @ 23:13, edited 1 time in total. Grim Fandango worked, but resolution forcing had way too many glitches for it to be playable with that. It's Direct3D8 (no idea what it uses ddraw.dll for) so you can just remove dgVoodoo2's ddraw.dll and it will play the introduction videos, but after that it will just go black screen. It works fine natively. Alexander has some mouse/focus issues (mouse may be invisible until you go windowed and back to fullscreen), but more interestingly forcing resolution doesn't work at all. The game runs fine, but dgVoodoo2's forced resolution is ignored. Last edited by ZellSF on 2017-8-02 @ 17:32, edited 1 time in total. If anyone has an issue with the Windows mouse cursor (especially the blue circle indicating that Windows is busy) being momentarily visible when you're playing, try forcing vsync in the dgVoodoo control panel. I've found that that greatly helps with Blade Runner and Outlaws. BTW, I've found that this holds for nGlide, as well, so it's not a dgVoodoo-specific issue. Darkened Skye works fine. No point in resolution forcing (but it works) since it renders nicely in high-resolution anyway. Invictus: In the Shadow of Olympus works as it should too. Any 3D the game uses seems to be rendered in software. Resolution forcing is pointless and it gives you double cursor problem (one cursor that's constrained in a 640x480 and moves according to that, one that's running at the forced resolution). The person who reported this earlier also claimed there were performance issues, I encountered none but this is one of those games that need vsync off. Simon The Sorcerer 3D works great with resolution forcing (usually limited to 1024x768), some minor issues getting it started (it insists on windowed mode), but once you're past that everything is great. Except some z-fighting, but that also happens natively. Cops 2170: The Power of Law. Just works perfectly, resolution forcing included. Usually limited to 1280x1024 with bad UI scaling. Bilinear blit stretch makes text invisible. Demo: http://www.gamepressure.com/download.asp?ID=5555 . For some reason the map loaded in the demo had the ground looking right, but the loading screen and skybox were still wrong. It sometimes works natively and with DxWnd, but no matter how much I tried dgVoodoo2 would not work. The demo has a different focus issue. Last edited by ZellSF on 2017-8-03 @ 18:47, edited 4 times in total. Platoon works great with resolution forcing. Usually limited to 1920x1440 and unscaled tooltips. It's weird how in some games almost everything is resolution independent except one little thing. SWAT 3 already seem to be recommended to run with dgVoodoo2, but no one's made a comment on resolution forcing. It works great and negates the lack of UI scaling in this game. Redline works, but only if you disable mipmapping in the game's options. Otherwise it crashes (it does not natively). Resolution forcing works too (usually menus are unscaled and higher than 2048x2048 resolutions crash the game), but you have to skip FMVs as they crash with resolution forcing (they're just company logos though). Tomb Raider 2 works. Resolution forcing creates some focus issue that forces the game into windowed mode. Borderless window gaming utilities might help workaround that. Only some minor UI elements aren't scaled natively (status bars, menu text). Tomb Raider 3 is pretty much the same without the resolution forcing/focus issues. Tomb Raider 4 & 5 work great and have no resolution scaling issues and as such no need for resolution forcing. Screamer 4x4 works in menus, but crashes when going ingame. Works fine with DxWnd. Didn't test this a lot though as when it crashes you have to log out and in again to get your keyboard working again. Red Faction works. Resolution forcing works with some minor glitches (the game has no UI scaling). Red Faction II also works, but resolution forcing is unnecessary as it has proper UI scaling this time. Railroad Tycoon 3 works flawlessly. Resolution forcing too with some very minor glitches as long as you disable hardware mouse (hardware mouse gives double cursor). Natively it seems to max out at 1600x1200 for me though I've heard it should support higher. Wallace & Gromit in Project Zoo seems to work perfectly resolution forcing included. Natively it is limited to 1600x1200. I had to run the configuration program in DxWnd as it crashes natively and with dgVoodoo2. Times of Conflict, the first game from the people who later developed The Gladiators: Galactic Circus Games (the one that crashes with "Floating point overflow") crashes with an access violation error. Which is really too bad since the game is locked to 800x600 and could use resolution forcing. It runs natively (terrible framerate though) and sort of works with DxWnd. With DxWnd it needs "Hot patch (obfuscated IAT)" flag , modal window style and window position 0,0,0,0. It also needs d3drm.dll and won't tell you about it. Blaze and Blade looks like a really bad PSX port. It works nicely in dgVoodoo2 with resolution forcing as long as you set font size to small in options (if you set it to large it will do its own interpolated 2x scale of fonts that won't play nice with resolution forcing). Bad UI scaling and limited resolution support by default (I think it was max 1024x768). Playing some more with Dungeon Keeper Direct3D patch. Couldn't get it working with dgVoodoo2 at all last time I tried but now I did. It sort of works. It needs "Disable Alt-Enter to toggle screen state" to be off, "Capture mouse" to be off and it needs to be run in window mode. Sadly setting "Disable Alt-Enter to toggle screen state" to off makes dgVoodoo2 interfere with borderless fullscreen utilities so menus will be messy. You can just alt-enter when you get in game, but eh... I wouldn't recommend trying this. By default the game is fixed resolution (640x480 I think). No idea why I couldn't get Dungeon Keeper 2 working with resolution forcing last time I tried. It works great now. By default it supports up to 1600x1200. You can set other resolutions in registry, but when I tried 3200x2400 it just reverted to 640x480 so maybe some sort of limit is in place. WildTangent's (now there's a name I haven't heard in a long while) Fate works perfectly. Resolution forcing makes shadows very glitchy but it has native high resolution support out of the box. dgVoodoo2 is actually sort of unnecessary here as the game runs perfectly without it. Sea Dogs runs nicely as long as you force resolutions. Higher internal game resolutions for some reason gives terrible performance in menus with dgVoodoo2 (I got 2 FPS at 3200x2400). The game has terrible UI scaling anyway, so forced resolution is better. Pirates of the Caribbean, which is actually Sea Dogs 2 does not share that performance issue, but insists on going into windowed mode. Looks great and dgVoodoo2 fixes bad UI scaling. Singles Flirt Up Your Life, Space Haste, Stolen. Nothing to say about these three. Work perfectly in dgVoodoo2, but have no need for resolution forcing. So does Lord of the Rings: Return of the King. Why did we never get The Two Towers for PC? This game runs natively in Windows 7 64 without the need for dgVoodoo2. You should also have the final patch version 6 installed for this game. Do you have DirectX 9.0c installed? What OS? Drake of the 99 Dragons runs perfectly but has no need of forced resolution. Also Thief works pretty well (though you want to be using NewDark for that). Metal Fatigue still isn't working with DirectX render. I'm running out of interesting things to test, so here's a summary of games with problems. Last edited by ZellSF on 2017-8-09 @ 14:14, edited 1 time in total. Outstanding work, ZellFS! What a dedication! I'm going to have a lot lot of stuffs to check out. Thank you very much, again!!! Mafia seems to work great? I didn't see any of the zbuffer problem mentioned since I only tried it for a few seconds. That problem is fixed in 2.54 and wasn't related to z-buffering as I guessed previously. But I can confirm the crash with multipass rendering. Update: I've just fixed the crash, however there are some transparency issues with multipass rendering (light auras). I get the same natively though (beside heavily distorted polygons) and according to the pipeline state, it's normal. That Asterix: The Gallic War actually works so I tested again and it sort of works. I get very inconsistent results when launching it. Especially when changing the config in ASTERIXSTART.EXE (even when changing to a config that worked previously). Weird. 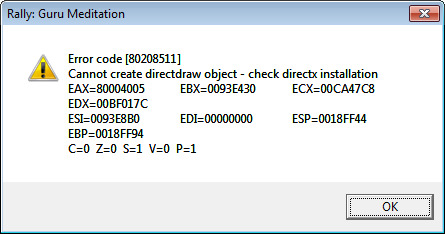 Armor Command crashes often when playing FMVs, though when I changed RSAPI DD.dll to use dgdraw.dll instead of ddraw.dll that stopped even though dgdraw.dll is just a renamed version of the same file as ddraw.dll. I have no idea why I tried that or why it works, but I'm happy since I actually want to play this game. Sanitarium is a paletted game and solves its bitmap conversions by the Windows DIB engine. I set compat mode 'Reduced color mode' to 8 bit and it runs fine with dgVoodoo. No idea why the bitmap conversion is corrupted when 16 or 32 bit mode is present, but the conversion itself doesn't have anything to do with dgVoodoo. Got a bit of an issue with a game called "Alien Shooter" by Sigma-Team. Natively in Windows 10 it works fine, other than some stuttering when you use the med-kit and when you get a shield. Also the FPS is uncapped causing some issue with the AI. But, with dgVoodoo, it works fine other than when you use the med-kit, the game just straight up crashes.